I Spy . . . New Hiking Trails! 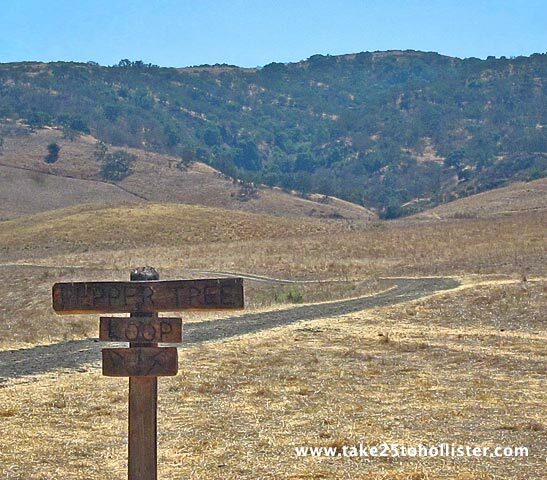 I spy with my little eye a new place in Hollister with trails for hiking, horses, and bicycles. Whooo-hooo! The place is called Mudstone Ranch, which is part of the Hollister Hills State Vehicle Recreation Area. Not to worry. This section of the park is dedicated to non motorized activities, meaning you won't come across any dirt bikes, ATVs, or other motorized vehicles. Having opened this summer, Mudstone Ranch is located on Cienega Road, a couple miles north of the main entrance to the Hollister Hills SVRA. If you're traveling from the north on Cienega Road, you'll find Mudstone Ranch soon after seeing the Hollister Hills Barn. 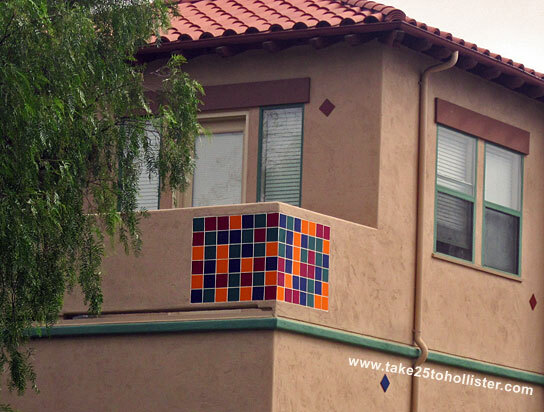 I spy with my little eye fantastic strips of pinks, yellows, browns, and whites on a eucalyptus tree next to the San Juan Bautista Library on Second Street. 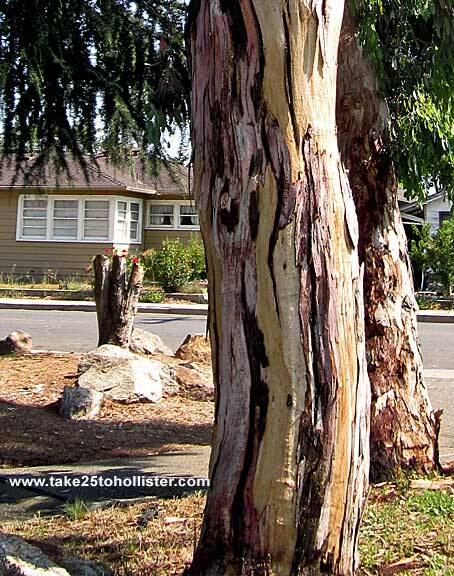 Today I learned that the eucalyptus tree, the largest flowering plant, is a rainforest tree species. Poor tree must miss the coolness like us, humans. 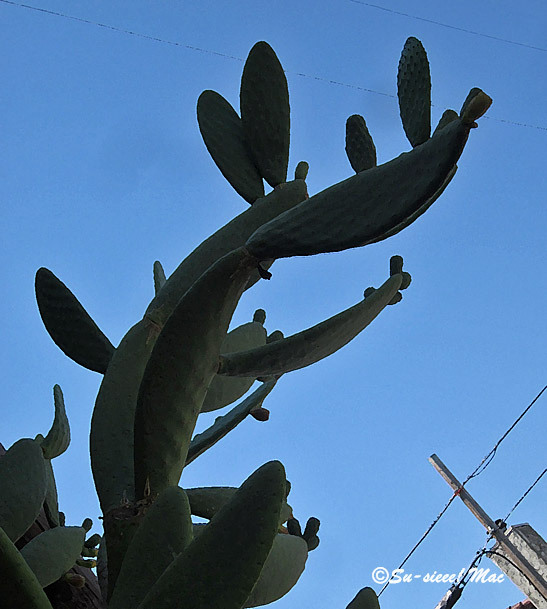 I spy with my little eye a dancing cactus on Fourth Street in San Juan Bautista. Actually, I saw quite a few cacti dancing over there that day the Husband and I were taking a stroll after eating breakfast at Vertigo Coffee. Giggle. 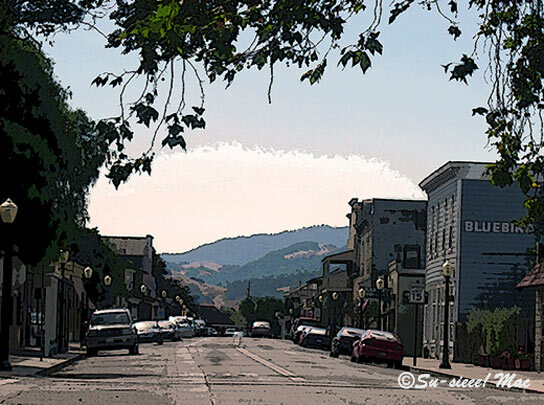 Downtown Hollister is a great town to walk. So many possibilities. Walk up and down the main street, side streets, and alleys. 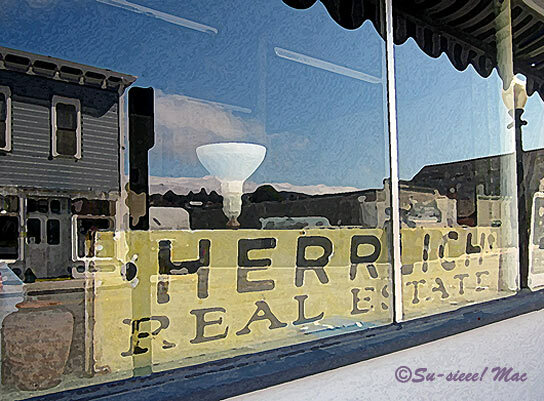 Venture into the residential area beyond South Street or to the west of San Benito Street. Climb up Park Hill and enjoy the view. 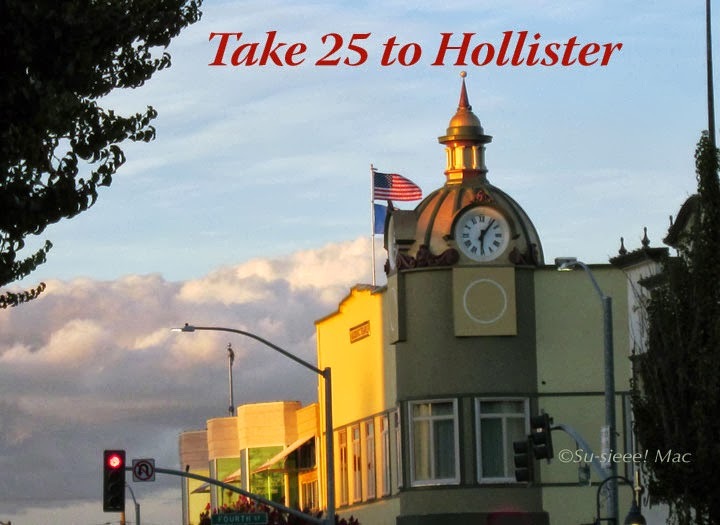 If you'd like something a bit more organized, check out these round-trip walks designed by the Downtown Hollister Association. 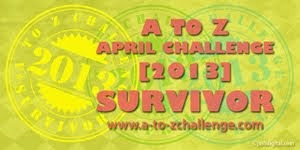 You can download a copy of its brochure describing the walks here. 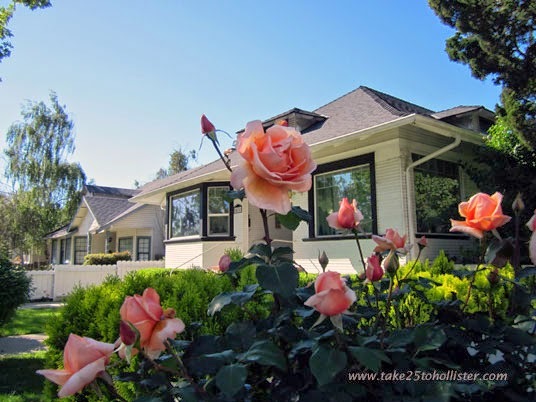 I've summarized the walks below, providing links to past posts on Take 25 to Hollister that give you some background on the subject matter of many of the walks. Sacred Heart Walk, a one-mile stroll, begins at Dunne Park where Sacred Heart Church originally was located. 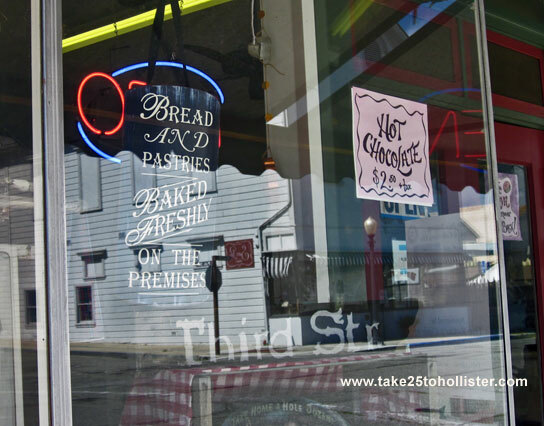 Downtown Shop Walk, 1.2 miles, allows you to see and visit all the shops and businesses in downtown Hollister. 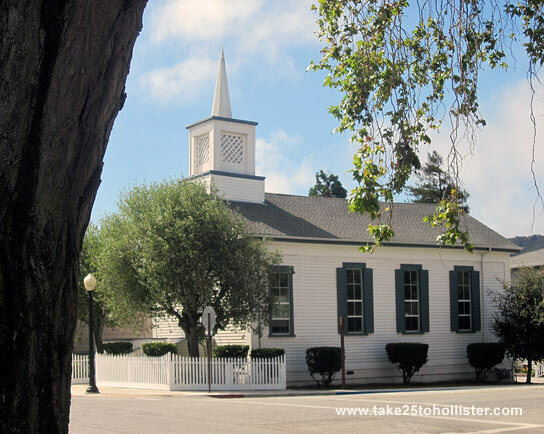 Historic District Walk is 1.3 miles long, covering the Downtown Hollister Historic District. Fault to Fault Walk is a 1.3 mile walk along the Calaveras Fault. Vista Park Hill Walk, 1.5 miles, takes you up to Park Hill, the highest point in Downtown Hollister. 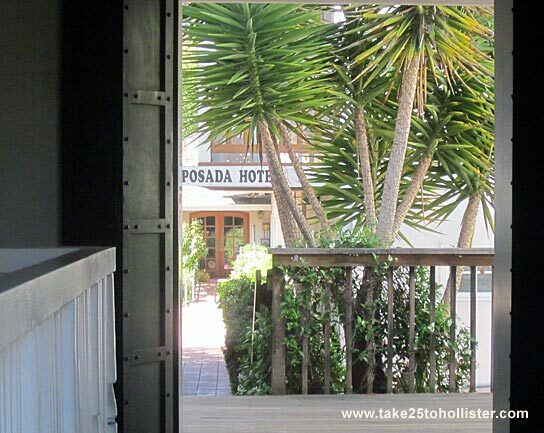 East of Eden Walk is 2.2 miles of some John Steinbeck history and movie settings for the East of Eden movie. 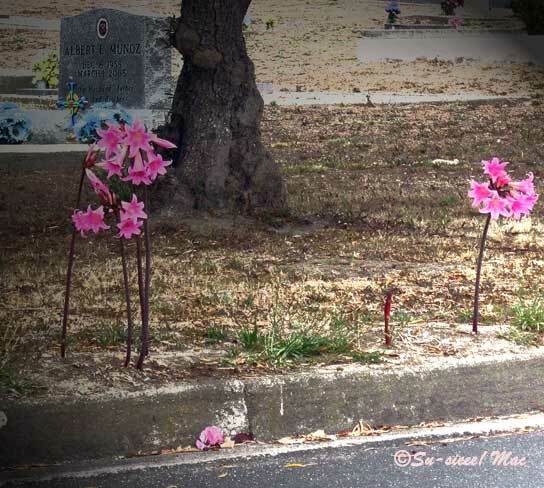 Hazel Hawkins Walk, 2.3 miles, starts at the original Hazel Hawkins Hospital and goes to the IOOF Cemetery on Buena Vista Road. 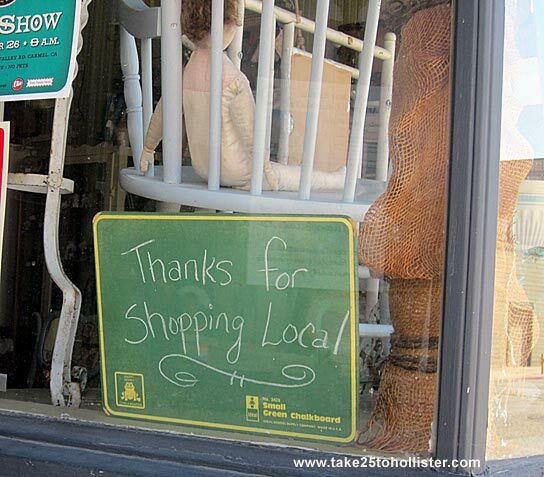 Have fun walking through downtown Hollister! E. T. in S. J. B.
Ah ha! 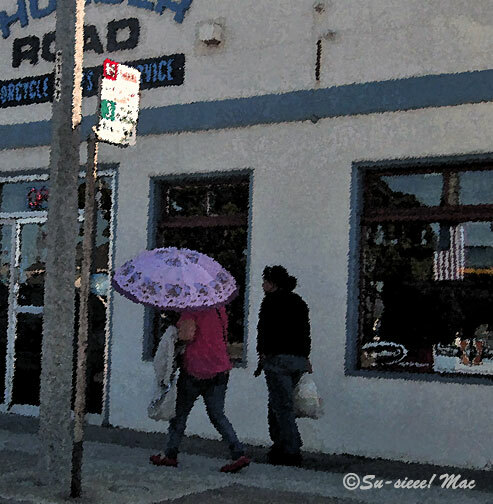 The Husband and I sighted E. T. in San Juan Bautista the other day. 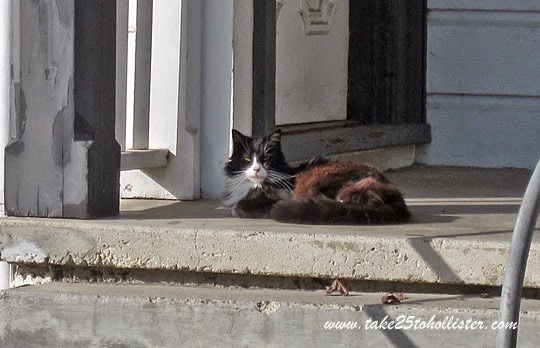 He was diligently guarding the parking lot to Casa Maria on First Street. 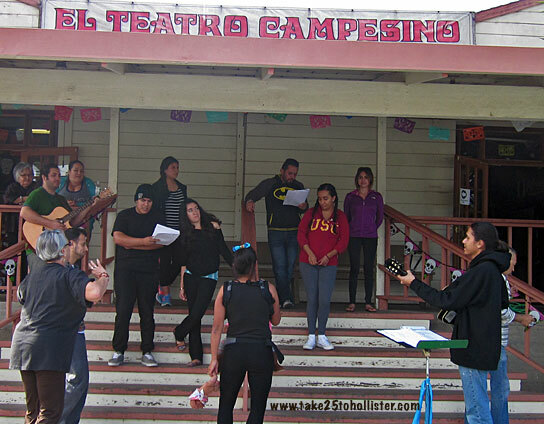 A few Sundays ago, while the Husband, our friends, and I were walking around San Juan Bautista, we came across the performers of El Teatro Campesiño practicing their songs on their building's front steps. Of course, we had to stop and enjoy the music. El Teatro Campesiño turned 50 years old this year. Check out this interview about the stage troupe and its founder Luis Valdez, written by Frank Perez published in BenitoLink. 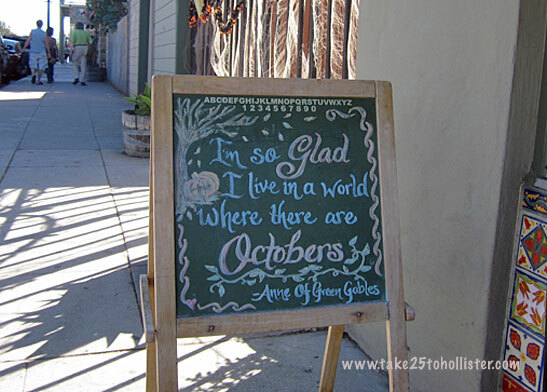 My appreciation to San Juan Bakery, in San Juan Bautista, for reminding me about the joy and wonder of October. The Husband and I have had lots of fun adventures in, around, and out of Hollister this month. Who knows what these next three October days shall bring. We've had some beautiful skies this summer. Hoping for r-a-i-n. 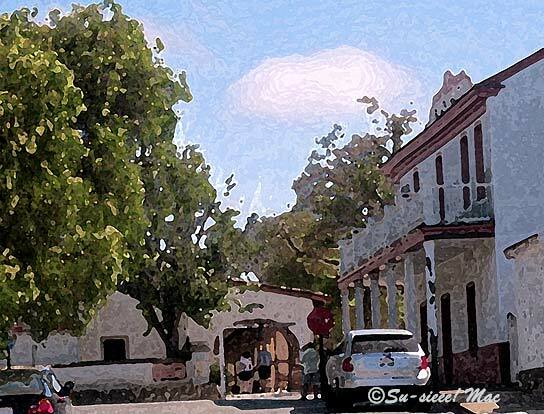 It's fun to walk around San Juan Bautista to see the Mission San Juan Bautista and other various historic sites and buildings, as well the shops, galleries, gardens, trees, valley views, and more. I'm glad I live nearby so I don't have to see it all in one day. 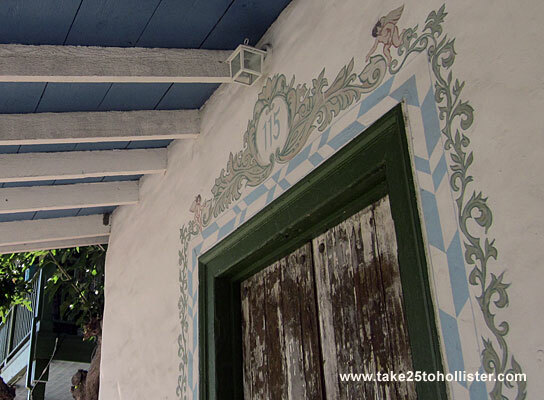 A good source to have on hand as your stroll through town is the San Juan Bautista Historic District Walking Tour Pamphlet. You can download a copy from this link. 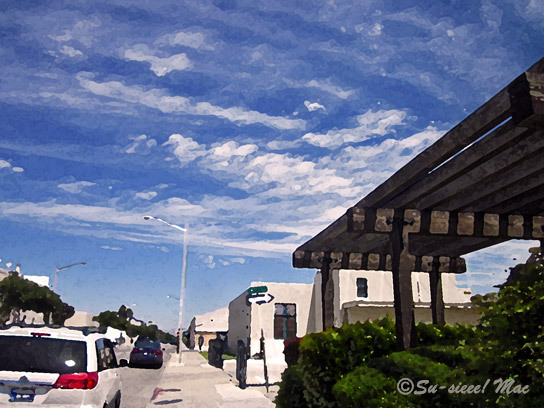 Here are a few more random street scenes of San Juan Bautista. 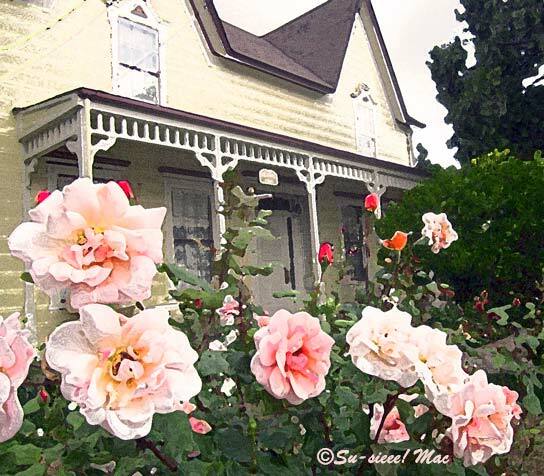 Roses, roses, and all sorts of flowers are every where in San Juan Bautista. 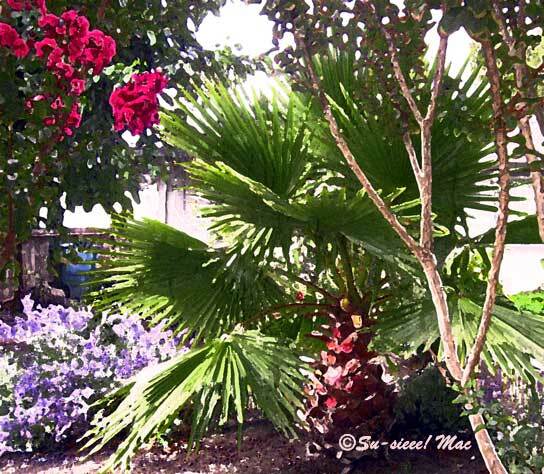 In personal gardens. 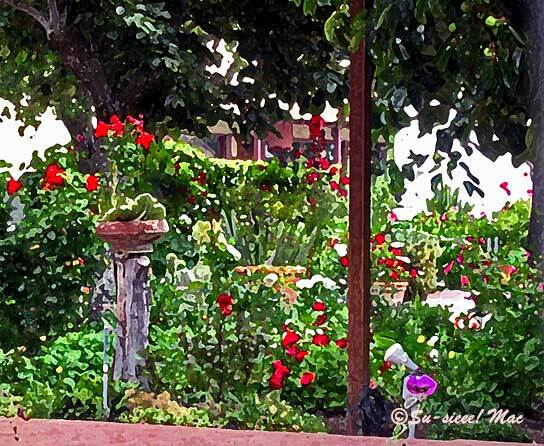 On restaurant patios. 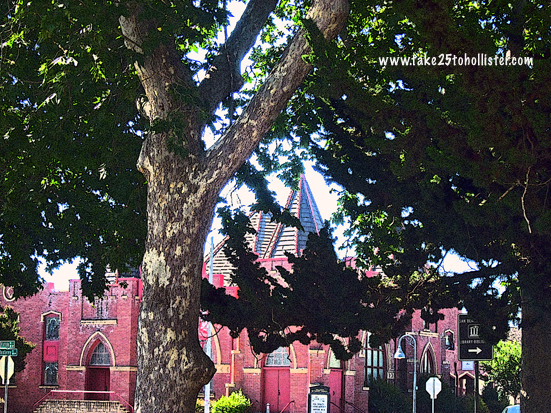 At the mission and parks. On sidewalks. Everywhere. And, oh so beautiful. Mmmm, I enjoy the shade of the lovely trees on Monterey Street, near Fifth Street. One gorgeous afternoon, the Husband and I had eaten a tummy full of yummy burgers and fries at Third Base Burger Bar on San Benito Street. Afterwards, we chose not to get back into our car but ramble down Seventh Street to the end and back. The walk did us well. 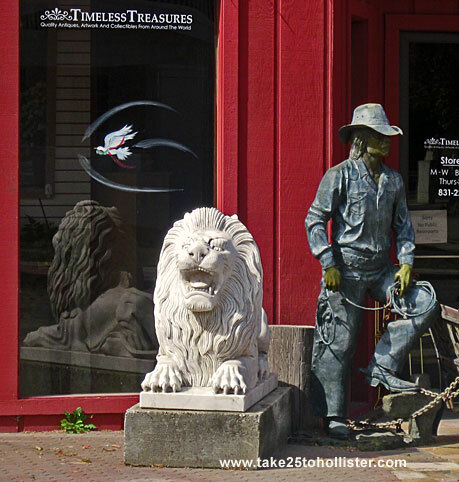 These photos show a few of the delightful sights that we saw. 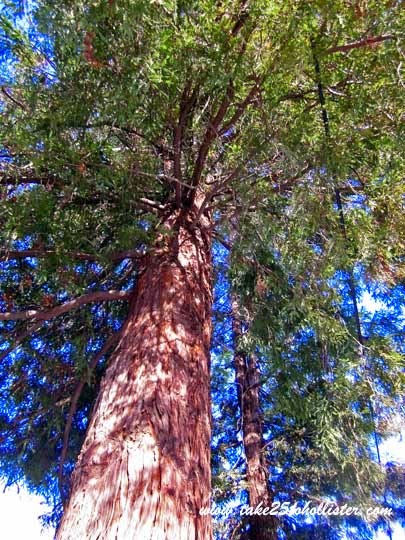 Did you know there are redwood trees on Seventh Street? 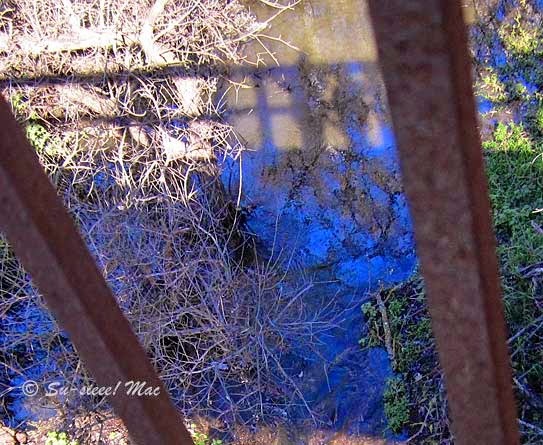 On New Year's Day, the Husband and I took a walk with friends at the southern end of Coyote Creek Trail in Morgan Hill, which is about 26 miles north of Hollister. 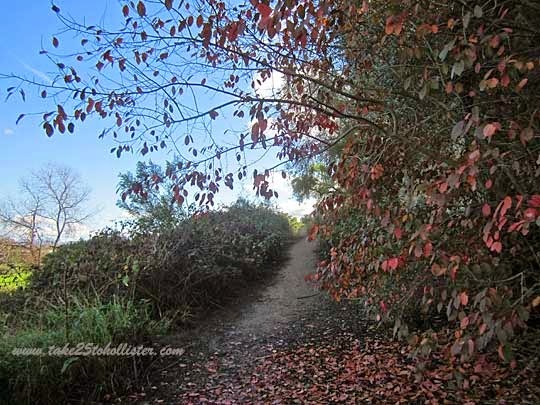 It's a very scenic trail that anyone can enjoy, from babies in strollers to older folks like me who prefer to stroll. If you're walking, do keep your ears open for bicyclists coming up from behind. 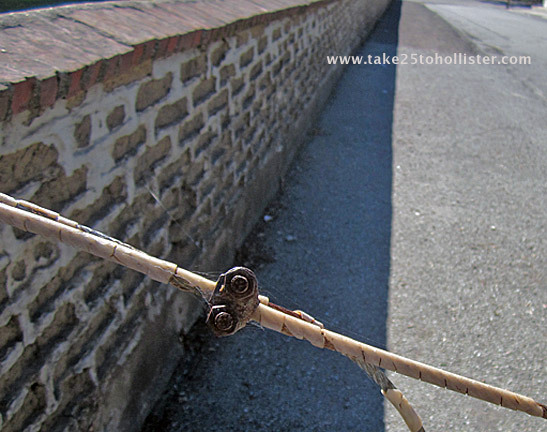 That all-of-a-sudden whistling you hear just may be an approaching bicyclist. 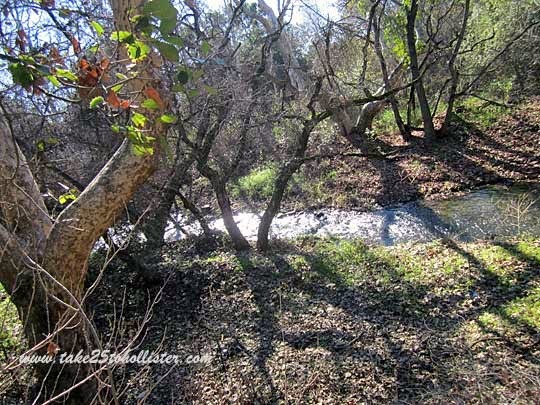 Coyote Creek Trail is over 18 miles long that runs through Santa Clara County. It has three sections that will eventually be connected. The longest segment is paved, and mostly flat, going from Morgan Hill to Tully Road. 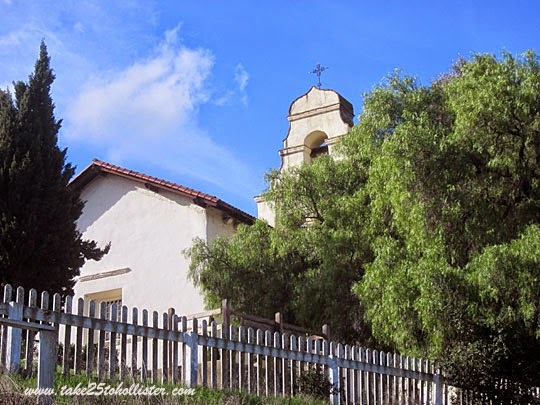 Below Old Mission San Juan Bautista is a short and easy walking path that overlooks the San Andreas Fault. We've been having some good rocking and rolling lately, by the way. Small healthy earthquakes in the threes and fours on the Richter magnitude scale to ease the tension of the fault. So, I hope. Okay, back to the path which is actually a segment of the original El Camino Real that ran between the 21 California missions, from San Diego to Sonoma. You can access the path either by the stairs next to the mission or from the south at the end of Franklin Street. 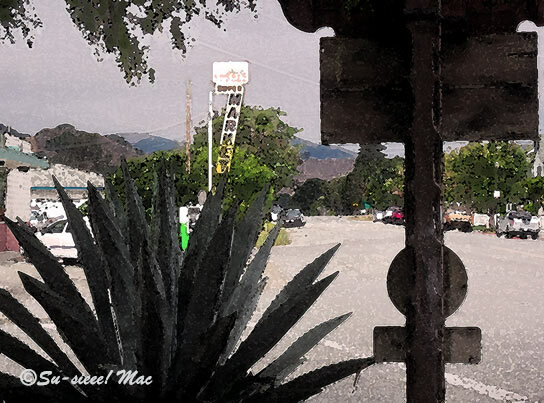 The path swings behind the mission and up to First Street by Casa Maria. Unfortunately, you are only allowed to walk part way on the path. 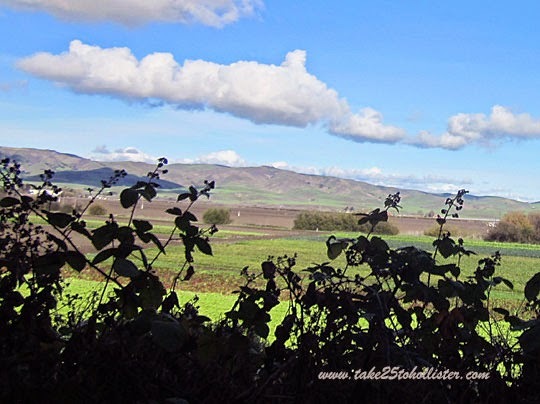 It's worth the venture, considering that you'd be briefly walking on the historic El Camino Real alongside the amazing San Andreas Fault as well as seeing some gorgeous views of San Juan Valley. 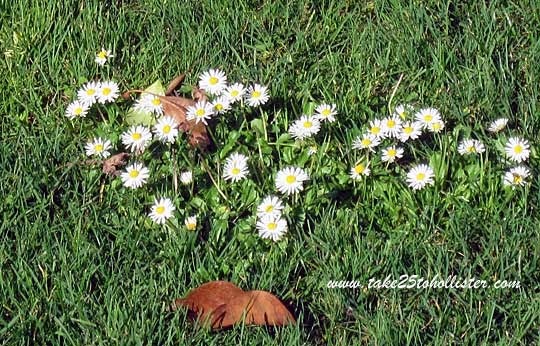 Taking photos allows me to get my exercise in the fresh air. 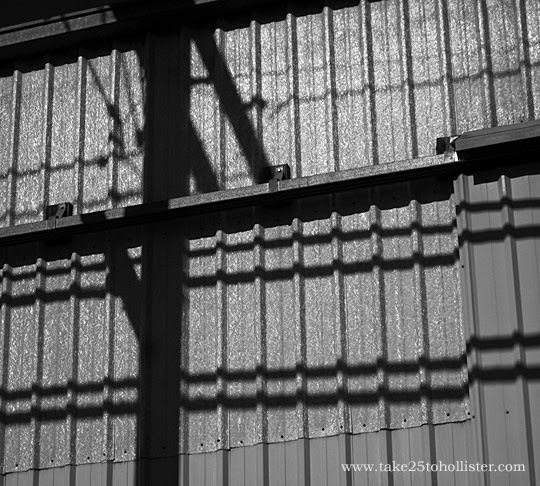 How else would I have ever seen the shadows on the corrugated metal building near the railroad tracks on Hillcrest Road? Check out black and white photos from other bloggers around the world at The Weekend in Black and White. We've been having some rainy days the past two weeks Yaaay! 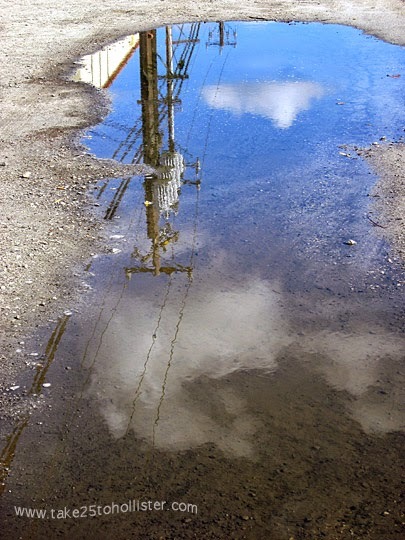 The days following the rainy ones are often gorgeous, as you can see in the reflection of this puddle on Hillcrest Road. Skywatch Friday is the meme for today. Come check out how the sky looks in other parts of the world by clicking here. 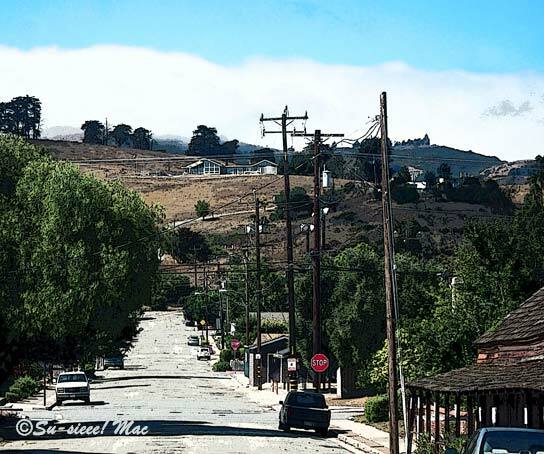 Vista Park Hill is a curiously that rises above downtown Hollister by Third Street. 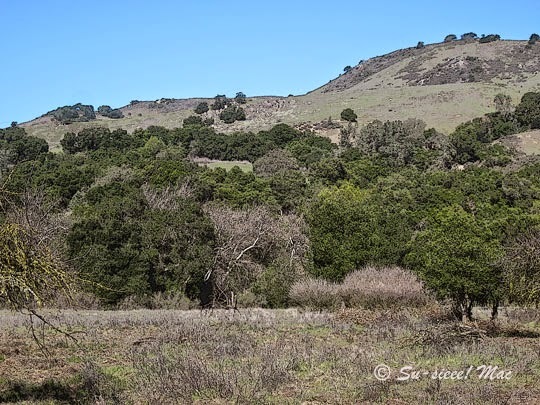 It's a lone hill which the Calaveras Fault skirts along the west of it. 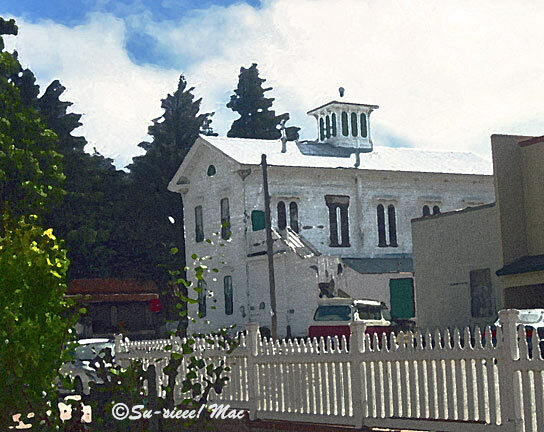 The other day the Husband and I walked up the hill, but this time instead of turning left, we went right to check out the county buildings and what was behind them. Whoo-weee! 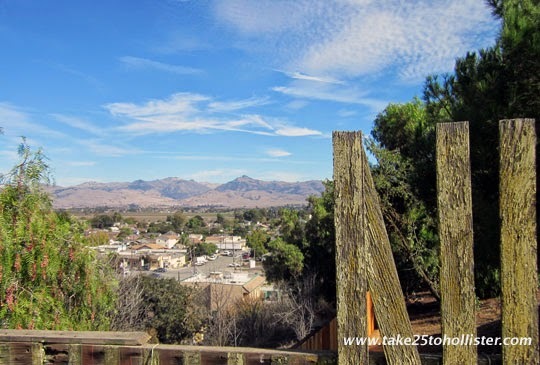 Behold the peaks of the Diablo Range to the east of Hollister. Today, the letter P is being featured on Mrs. Nesbitt's ABC Wednesday. 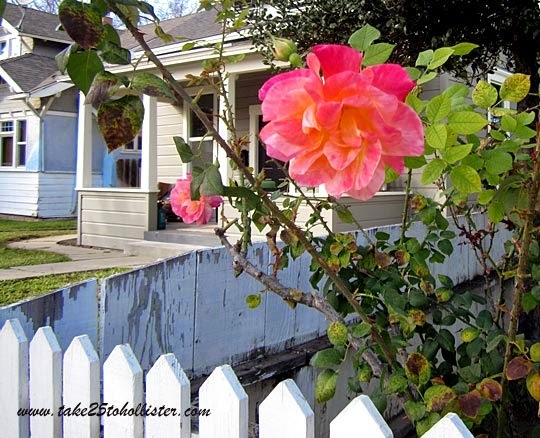 Click here to read other P posts by bloggers from around the world. Yup. Look around. 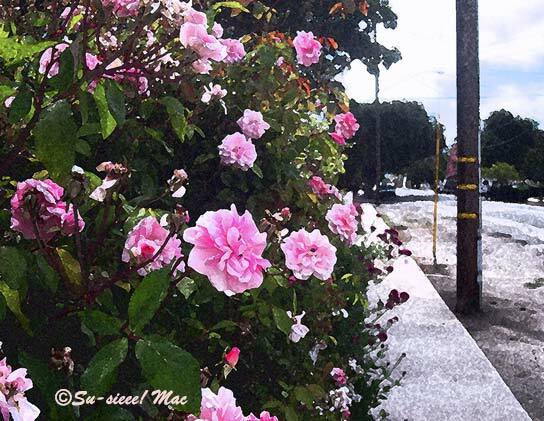 They are in bloom. 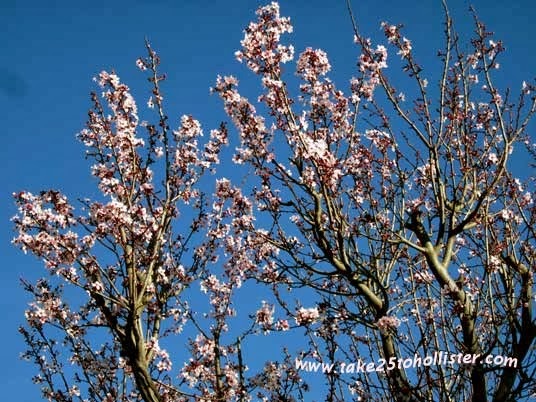 The pink blossoms always surprise, delight, and amaze me every year.